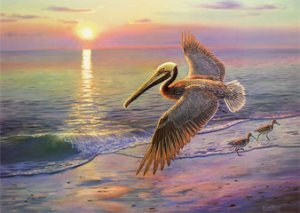 Welcome to the website of Randy McGovern, one of the nation's most popular wildlife artists. With his fanatical attention to detail and skill as a painter, he has become a world-renowned bird, fish and wildlife artist. Working in precise detail in oil, he attempts to capture each animal in its natural habitat, with an endearing background and a rich use of light. Randy is famous for hiding smaller animals within the portraits of larger ones. For example, the picture at left contains 6 hidden animals. About 95% of Randy's prints have hidden creatures. They make a great conversation piece! Call for FREE catalog of all limited edition wildlife art prints by wildlife artist Randy McGovern! Please click to Bookmark McGovernWildlife.com NOW! All Content is Copyright © 1983-2019 by McGovern Wildlife Art Prints Collection. All Rights Reserved.